Is Cam Newton NFL's most underrated QB? CHARLOTTE, N.C. – There was an enormous bandage on Cam Newton's side as he walked through the locker room after Sunday's 24-7 victory against the Detroit Lions. It was in the shape of an X. "X marks the spot!" joked one Carolina Panthers teammate. Newton grinned. That teammate was right. A huge target has been on Newton since he got into the league as a flashy No. 1 overall pick in 2011. He's been criticized for his sideline demeanor and scrutinized after a difficult second season in the league. On Sunday, the target was physical, too. Newton has been limited by a sore ankle and a hairline rib fracture – hence the bandage. He couldn't even play in Week 1 at Tampa, and so he went out onto the field Sunday to face one of the league's best defensive fronts without ever having thrown a meaningful pass to any of his current receivers. Newton is known as a mobile quarterback, but all he could really do against Ndamukong Suh and the Lions was stand in the pocket and throw. He was fantastic: resilient, efficient and sharp. "After that first sack," said Panthers receiver Jason Avant, "we knew he was gonna be in there." Fantasy owners may not have been delighted with the stat line – 22 of 34 for 281 yards – but Newton was the perfect game manager: throwing a touchdown and no interceptions for a 100.2 QB rating. 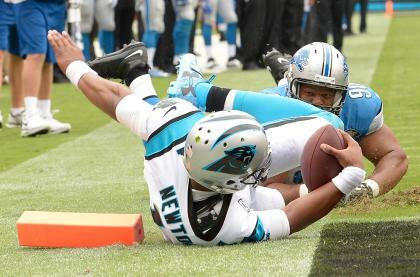 His defense put him in a position to win, and Newton won. The Panthers are 2-0 for the first time since 2008, and this is after many believed the team would sink after an NFC South division title in 2013. Newton had plenty of reason to be sour after this offseason. He lost his favorite target, Steve Smith, and the Panthers didn't replace him with any explosive receivers. The team drafted Kelvin Benjamin, who looks like he could be a star, but there isn't much else to keep a defense off-balance. Avant is steady but not a yards-after-catch guy. While the Lions did anything and everything to keep Matthew Stafford happy, drafting tight end Eric Ebron and signing Golden Tate, Newton got little help. He doesn't even have a star running back. Newton didn't say a negative word. And he didn't seem despondent when he couldn't play in Week 1. He bolted out onto the field in Tampa during a timeout to shout encouragement in the Panthers huddle. This is the stuff leaders do: play through pain, refrain from venting, cheer on teammates through injury. "He was in an awesome groove," said tight end Greg Olsen. "To miss the amount of reps he has – up until this week, he was pretty limited – under that pressure against these guys. He was basically a pocket quarterback." That's important: he could have easily decided that he needed to do it all himself, bum ankle and all. He wears the No. 1 jersey. He's the franchise. Superman. Newton stayed within himself and he made plays. He didn't force anything. He took brutal sacks. On three separate occasions, Lions put him on the ground and then mocked his "Superman" move. Newton got up and returned to the huddle. Plenty of ink has been spilled about Andrew Luck, Robert Griffin III, Russell Wilson, and Colin Kaepernick. Newton toils away and wins in the relative quiet of this Southern city. When he makes an ill-advised comment, like referring to Ndamukong Suh as "Donkey Kong," the nation takes notice. Then when he leads and wins, it's back to ho hum. Sure, he's paid a fortune to do that. But the target on him is bigger. And his own targets have been taken away. He deserves more credit for stopping his sulking ways and working more closely with quarterbacks coach Ken Dorsey – who was also new to him and new to his job when he arrived last season. Think of the pressure Newton has taken off not only Dorsey and offensive coordinator Mike Shula, but also a new crop of receivers and even general manager Dave Gettleman, who got deserved heat for letting Smith go. Newton is absorbing more than just brutal hits. The Panthers are just as underappreciated as their star. This is a top-five team, and maybe top-three in the league. Cam and Carolina nearly beat the Seattle Seahawks last season in the opener, and they did beat the San Francisco 49ers in the regular season before losing at home to them in the playoffs. The defense is nothing short of stellar, but a strong defense doesn't really hold up unless there's a quarterback to take advantage of it. Just ask the New York Jets. Newton has the flashy smile, but the flashy style has ebbed and a grittiness has surfaced. It matches his team's personality. It works because Newton makes it work. When stolid head coach Ron Rivera started taking Les-Miles-like risks on fourth down, he was bestowed with the playful "Riverboat Ron" label. But "Riverboat Cam" would sink fast in the esteem of pundits if Newton started throwing bombs like Brett Favre. When Favre made questionable decisions, he was a "gunslinger." If Newton did that, he'd be "stupid." Look around the NFC South. The Tampa Bay Buccaneers are struggling. The Atlanta Falcons are suspect. The New Orleans Saints lost to the Cleveland Browns. It's expected that a different team wins this division every season, but good luck picking against the Panthers to repeat. That's tough to do if you're not the New England Patriots, and very tough to do if you're a No. 1 overall pick who came to a city that hadn't known winning for a while. Cam Newton is only 25. He's just entering his prime. He didn't handle everything well in his first two seasons, but now he's handling a bad wheel, an aching middle and a target on his back. He's managing that as well as he's managing the game: just about flawlessly.